The endangered Kirtland's Warbler is Michigan's rarest bird. Warbler nesting grounds are found primarily in the many acres of Jack Pine forests around the Grayling Area and are off limits during the nesting season, except in guided tours. The female Warbler builds her nest of leaves and grass below 5-20 foot tall Jack Pines in the midst of dense undergrowth. Four to five cream-white or pink-white eggs with brown spots are laid in the nest in May or June. Sometimes Warblers will start new nests after the first eggs have hatched. In the fall Kirtland's Warblers migrate to the Bahamas. The Warbler's extinction is being caused primarily by loss of its very selective habitat. Managed timber harvest, tree plants, and controlled burning have helped double the number of Kirtland's Warblers from 1961 to now. To get more information on the Kirtland's Warbler visit the Department of Natural Resources Kirtland's Warbler Site. Birding Blast Specialty Tours Northern Michigan - is home to more than the unique Kirtland's Warbler, the symbol of the Michigan Audubon Society. Perched on the border of the northern hardwoods and the Canadian boreal forest, Northern Michigan invites a spectacular assemblage of breeding and migrant birds. The all-new MAS "Specialty Tours" target some of the more highly-prized species. Tour routes are thoroughly scouted to maximize your chances of seeing all the species you are looking for. Additionally, the MAS knowledgeable tour guide will provide an enjoyable interpretive tour tailored to each participant's interests. Hanson Hills Recreation Area - Miles of walking trails through rolling oak hills offer possible sightings of Woodpeckers, Red Shoulder and Red Tailed Hawks, Turkey Vulture, Ovenbirds, Eastern Phoebe, White Breasted Nuthatch, Chickadee, Wood Thrush, Veery, Hermit Thrush, Brown Thrasher, Song and Field Sparrow, Turkey . With 70 percent of its' property owned by the state and federal government and open to the public, Crawford County is a hunter's dream. Various types of terrain yield trophy sized bucks, snowshoe hares, squirrels, turkey, grouse, woodcock and waterfowl. There is an abundance of upland forest types including Oak, Aspen, Maple and Jack Pine. There are many swamps in the area which contain Cedar browse for deer. Rifle, archery, and muzzleloading seasons are held. Youth hunts and antlerless deer permits are also available. For those who are interested in hunting the animals, it is advisable to check local sport shops to obtain information on where to go. Turkeys are also plentiful in the county and can be found in upland areas as well as valleys where many seed bearing trees are available. Bird hunters will find Ruffed Grouse (Partridge) plentiful. They are often found in Aspen stands and along swamp edges. Woodcock are also available in many areas. Black, Gray, Fox, and Red Squirrels can also be found in plentiful supply here. Although they can be found virtually anywhere, the greatest success can be found near mature Oaks where there is ample nesting cover. Snowshoe Hare as well as Cottontail Rabbits can be found in the county although many more Snowshoes than Cottontails are available. A dog is recommended in the thick swampy areas where the snowshoes are likely to be found. It is possible to take the animals without a dog by patiently stalking. Not only is snowmobiling welcomed, but the cities of Crawford County have been designed for you to get around town in your snowmobilie. With the hundreds of miles of state land available there are plenty of lodging accomodations that allow you to snowmobile right outside your door. 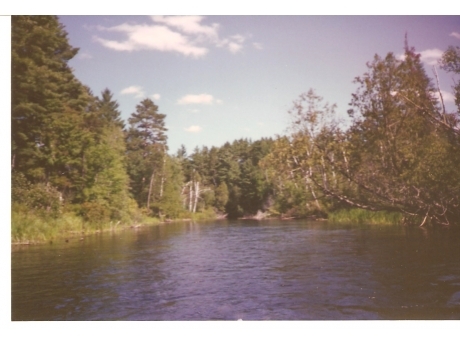 The headwaters and mainstream of the AuSable River flow within easy driving distance of Grayling. For that matter the mainstream itself flows through the city although to see the most scenic aspects it is advisable to obtain a county map and cross it further downstream. Perhaps the best way to see the true wilderness is to use a canoe and paddle silently down the stream. Manistee River: Although not as well-known as the AuSable River, the Manistee River is a hidden jewel. Much of its length is less populated by humans than the AuSable. It is ideal for wildlife watching and scenic photography. Here again a canoe is the best way to obtain the wilderness experience although scenic wonders can be had at any woodland area bridge that spans the river. Birds found in the AuSable and Manistee rivers: Numerous public access sites are available. Look for Mallards, Black Ducks, Mergansers, Great Blue Herons, Baltimore Orioles, Sand Pipers, Downy, Hairy,and Pileated Woodpeckers, Blue Jays, Grackles, Red Wing Blackbird, Chickadees, White and Red Breasted Nuthatches, Turkey, Kingbird. A canoe float trip is a quiet trip and one of the best methods of viewing the many species. Ausable River Canoe Marathon - The Longest Non-Stop Canoe Race in North America and the Worlds Toughest Spectator Race! The canoe marathon runs from Grayling to Oscoda, Michigan with prizes totalling $50,000. Enjoy this great race in its 59th year, being held from July 29-30, 2006. Hartwick Pines State Park will again be offering special evening ski events where skiers will have a chance to enjoy one of the park's groomed ski trails by lantern light. The ski nights will be from 6pm to 9pm on the Saturday evenings of January 28, February 11 and February 25. Over 75 lanterns will be lit along the 1.25 mile, groomed cross-country ski trail. The Michigan Forest Visitor Center will be open and visitors are welcomed to "thaw out" (or cool down) in our warming room where hot beverages (cider, tea, coffee and hot cocoa) and snacks will be offered. There is no charge to participate in these evening ski events however a daily motor vehicle permit is required to enter the park. If you cannot make it to these evening events, please come visit us during the day and enjoy skiing on over 15 miles of groomed cross country ski trails. Other events at Hartwick Pines this winter include guided snowshoe hikes on selected Saturdays in January, February and March. For further information and for current ski and snow conditions, please contact the Michigan Forest Visitor Center at (989) 348-2537. More about the Hartwick Pines State Park - With an area of 9,672 acres, Hartwick Pines is the largest state park in the Lower Peninsula. The park's rolling hills, which are built of ancient glacial deposit, overlook the valley of the East Branch of the AuSable River, four small lakes and unique timber lands. The principal feature of this park is the 49-acre forest of Old Growth Pines which gives the park its name. This forest is a reminder of Michigan's past importance in the pine lumber industry as well as a source of inspiration for the future of our forests. The park is rich in scenic beauty and because of the different habitats it encompasses, there is ample subject matter for the sports person, photographer, or naturalist throughout the year. In general, public lands are open to biking. Any designated snowmobile trails are open to riding, with the exception of the ORV trail West of Grayling on M-72. The Hanson Hills Bike Trails begin at the left of the Cross Country Ski Lodge following the Little Smokey around the pond. Approximately 3/4 miles of flat trail take you to the first single track hill climb. The opening stretch is a little sandy. This exciting trail has a four mile loop and a one mile loop which was added the spring of 1998. Lots of fun down hills and beautiful terrain and wildlife make this a great trail system for the intermediate to expert riders. Hanson Hills hosts The Fat Tire Festival the first weekend in June each year. The Rayburn property on North Down River Road is a scenic trail open to the public. This combination 2 mile paved trail and two-track winds down to the AuSable River where bikers can cross on a primitive bridge and continue to M-72 East. The Wakeley Lake non-motorized area consists of 3 loops, 4 1/2, 5 and 7 miles in length. The terrain is well suited for the novice/intermediate with 0% steep, 25% hilly, 55% moderate and 20% flat. Wakeley Lake is a gem and home of the Loon. Tisdale Triangle 10.1 miles, flat terrain, hiking skiing, camping at e. end of Tisdale Rd., 5 miles E. of Roscommon on M-18. Red Pine Natural Area 1.5 miles, level terrain, interpretive foot trail, no camping. 8 miles N. of St. Helen on F-97 to Sunset Rd., then E. 3/4 miles to trail. Pine Baron 8.75 miles, flat terrain, hiking, skiing, camping. W. of Gaylord & S. of M-32; W. from I-75 at S. Gaylord exit 279 on Alba Rd., 2.4 miles to Lone Pine Rd., N. to end of road. Big Bear Lake 2.2 miles, flat to rolling terrain, hiking, camping M-32 from Gaylord to Co. Rd 495 (Meridian Rd. ), S. 1.5 miles to SF campgrounds. Buttles Road 7 miles, flat to rolling terrain, hiking, skiing, no camping. Between Lewiston & M-32 on Buttles Rd., take Buttles Rd. N. about 3 miles to parking lot.